ACCRA, Ghana — It had been 12 years since Rita Sarpong went home to Ghana. 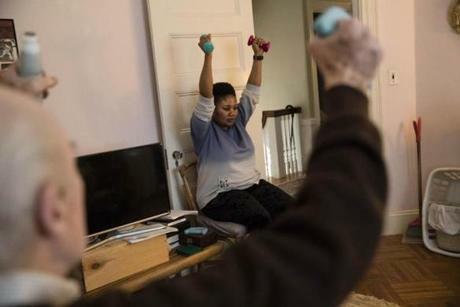 She’d missed siblings’ weddings, the births of nieces and nephews, even the death of her father, sacrificing time with her own family so that she could help frail, aging Americans stay at home with theirs. 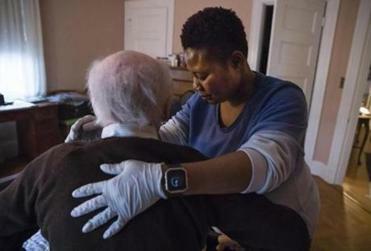 Sarpong, who often works 100-plus hour weeks, tended to a 90-year-old client at his home in Newton. Sarpong was excited to be returning to Ghana after 12 years. 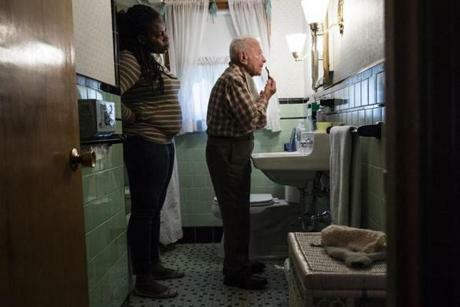 Aba Owusu watched as a client Ned DeRubeis, 91, shaved at his home in Newton in February. 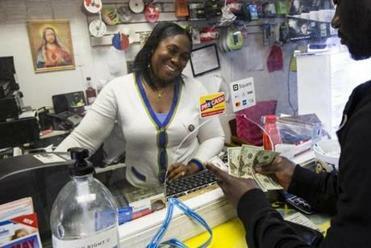 Owusu, a visa lottery winner from Ghana, spent four overnight shifts a week tending to DeRubeis’s needs. He died in May. And home care agencies generally compensate workers only for the hours they work, not paying them if they take time off, or even if a customer suddenly dies and leaves the worker without someone to care for. Sarpong guided her 90-year-old patient through morning exercises at his Newton home. Congregants at the New England Ghanaian Seventh-day Adventist Church in Worcester. At Camara Trading, a shop selling African groceries and other items with a heavily-trafficked money-transfer kiosk, owner Mark Kuffour says a large percentage of his customers are home care workers. He was one himself, years ago. As though on cue, a young woman walks up to the kiosk and asks to send $160 to Ghana. 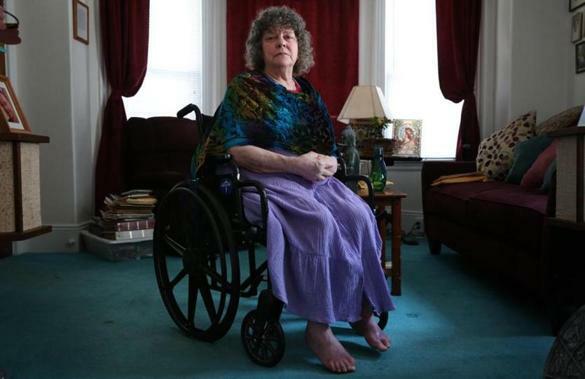 She’s a personal care attendant, she said. The money is going to her husband. Sending money back home is an unwritten rule of the Ghanaian diaspora. In Ghana, family responsibilities are paramount. 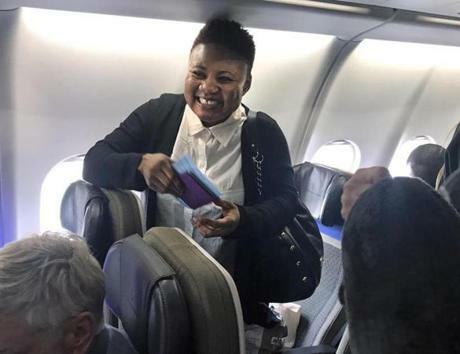 Gloria Camara took cash from a customer sending a “remittance” home to Ghana. Her shop is on Main Street in Worcester. 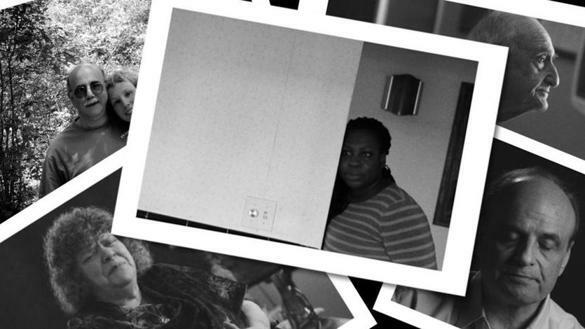 The Newton family pays her $25 an hour, which comes to $1,400 a week. 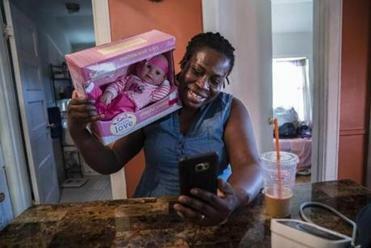 Out of this, she pays $1,600 rent, $1,100 a month for her daughters’ student loans at Anna Maria College, $900 in car payments for her car and her daughter’s, plus utilities, life insurance for herself and her mother, and her health insurance. Not to mention taxes. And she tithes $210 every week to her church. 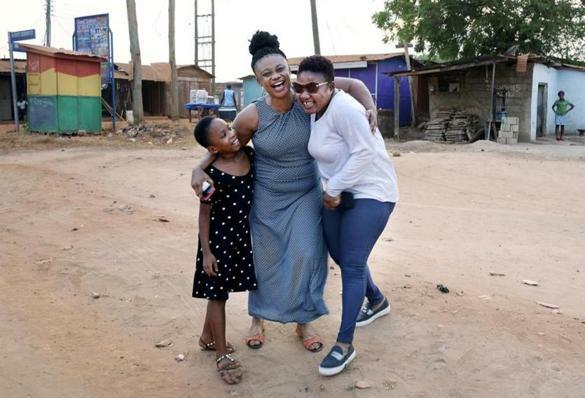 These hard-earned remittances — used to pay for education, care for sick family members, even feed families — represent a hefty and increasing chunk of Ghana’s economy. In 2008, they constituted less than 10 percent of household income, according to the Ghana Living Standards Survey. 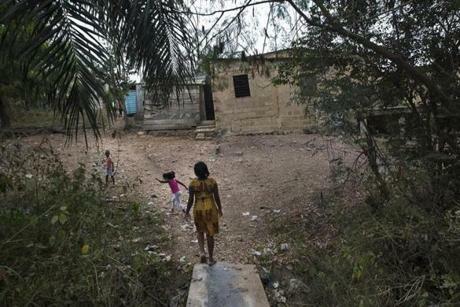 But by 2016, they amounted to more than $2 billion, or 20 percent of the economy, more than the revenue Ghana receives in taxes and international aid. Despite Ghana’s reputation as one of Africa’s fastest-growing economies, life for many remains a daily grind and a struggle. The average annual salary is about $3,500. More than 2.2 million Ghanaians couldn’t afford to feed themselves even if they spent all their money on food, according to a 2016 World Bank report. 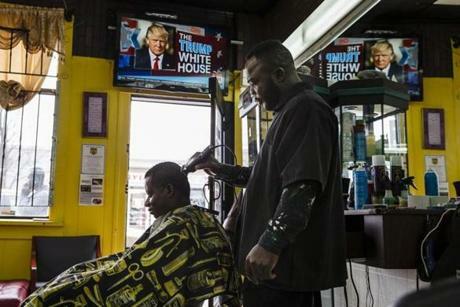 The unemployment rate is close to 12 percent. In the capital city, countless men, women, and even children work in the “informal economy,” which is economics-speak for people who balance heavy bundles on their heads in the hot sun, hawking their wares. 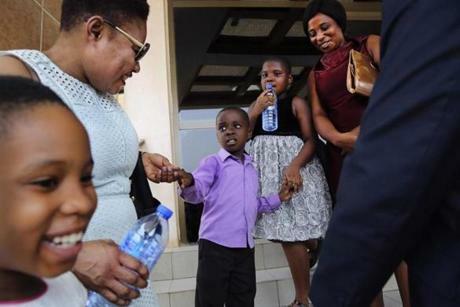 Sarpong’s nephew Nana Sarpong Owusu Duah (in purple shirt) held the hand of his sister, Tracy Owusu Dua, as he met his aunt. The children’s mother was on the right. Does he know what she does for a living? He doesn’t. Sarpong tells her family as little as possible about what she does and how hard she works. William Owusu was warm and gracious, though tired at the end of a long work day as a newspaper editor, with hours left before the kids would go to asleep. The house they rent is tidy and comfortable, though sparsely furnished. The kids sleep on the floor, on mattresses. There’s no hot water in the house. 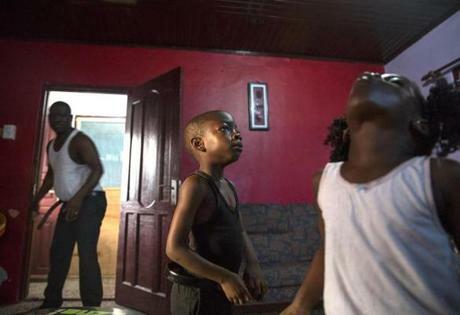 Owusu’s children, Yaw (center) and Yaa, gargled with mouthwash, part of their morning routine, as their father, William Yaw Owusu, got ready for work. He is the deputy editor of the Daily Guide, a widely read private newspaper in Ghana. 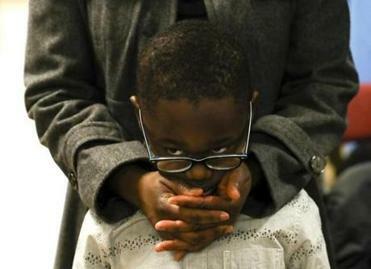 Owusu talked to her children over Skype while at her apartment in Pawtucket. She was reminded of how much easier life is in America when she ran into an old classmate at a market and he looked old and gray and emaciated. “It broke my heart,” she said. 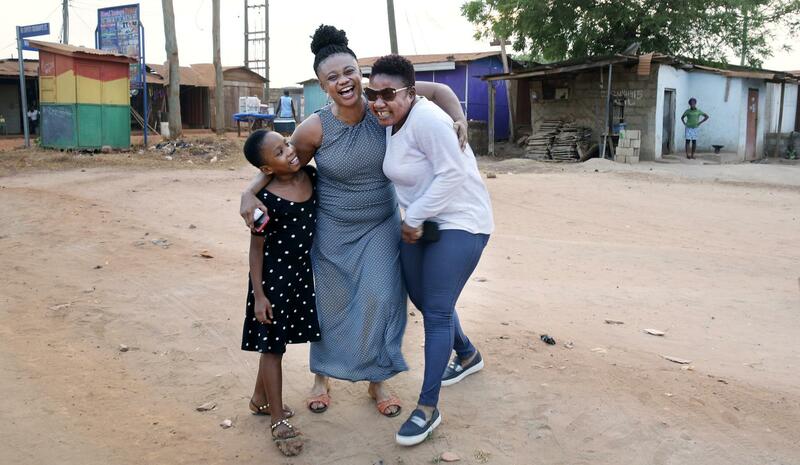 Her family in Ghana told her they felt badly they were so dependent on her but would like to buy a tro tro — a minibus taxi typically patronized by poor people — so that they didn’t have to keep asking her for money. But where would she find the money to buy a tro tro? Sarpong at the Newton house where she works as a home health aide.